White supremacists are using particular symbols to identify and target Jewish names. Now Jews and non-Jews alike are fighting back. Spend any time around prominent opinionated Jews on the Internet, particularly on platforms like Reddit or Twitter, and you’re likely to encounter an odd anti-Semitic practice. White supremacists associated with the alt-right, many of them avid supporters of Donald Trump’s presidential campaign, like to highlight Jewish users for targeting with parentheses: (((Rosenberg))), for example. Want to raise awareness about anti-Semitism, show solidarity with harassed Jews & mess with the Twitter Nazis? Put ((( ))) around your name. Then I went to bed. It turned out a lot of people—not just Jews—liked the idea. 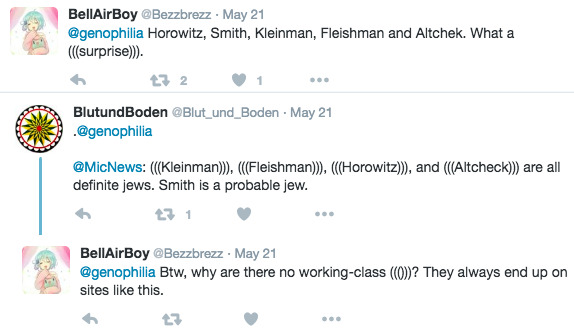 Some anonymous accounts even outed themselves as Jews to show solidarity. Muslims, Christians, and Hindus changed their names to show their support. As of now, hundreds of accounts have appropriated the Nazi symbols as their own. @fmitchell @Yair_Rosenberg @jonrosenberg Non-practicing Hindu, myself. But gonna go for it, hate Nazis. Most memes are ephemeral by nature, but Pepe is not… He’s a reflection of our souls, to most of us. It’s disgusting to see people (‘normies,’ if you will) use him so trivially. He belongs to us. And we’ll make him toxic if we have to. Which makes stealing the bigots’ signature symbolism for Jews all the more fun. Thanks to everyone participating in this act of (((cultural appropriation))). Since the culture in question is Nazi, it’s permissible. Previous: Who Are Trump’s Alt-Right Supporters? What Fuels Trump-Supporting Twitter Trolls?